Honestly, we had not heard of Lassen Volcanic National Park before it was brought to our attention as one of the stops on the 1920 Part-to-Park Tour; and we are pleased that it was. 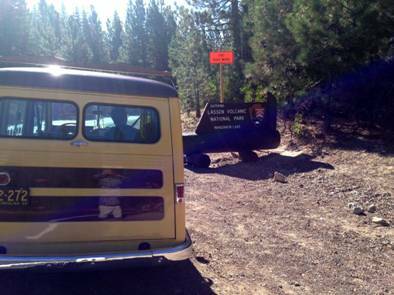 Ironically, although Lassen Volcanic National Park was one of the scheduled stops on the 1920 tour, due to lack of roads to and within the Park, the Tour group did not actually visit this Park, but rather encouraged the construction of roads during their stop in Reading, California some 50 miles west of the Park. Nevertheless, this was one of the intended stops (and besides, we had had a Park sticker printed for it), so Jean and I decided to spend half a day driving through and exploring the Park. An important note of disclosure: Although our original intensions had been to follow the route of the 1920 Park-to-Park Tour as closely as possible, we have since deemed that plan to be impractical and not well suited to our safety and enjoyment. First of all, in several cases the roads used by the 1920 tour (Interstate-5 running through much of California, for example) are now high speed heavily traveled Interstate Highways. At a prudent top speed of 55mph, we do not belong on such thoroughfares. Often there are no closely paralleling byways; and if there are, they are very tedious to maneuver in congested areas. Secondly, the Tour group went well out of a direct Park to Park route to visit municipalities such as Seattle, San Francisco, and Los Angeles to promote the construction of roads to the Parks – as well they should. With those cities considerably larger now, and incorporating the Interstate Highways previously mentioned, it was just not practical for us to make every city stop on the Tour’s itinerary. With the desire to avoid major thoroughfares, the elimination of the impractical stops, and to permit the inclusion of other interesting places, Jean and I at times selected routes that were different from those of the original Park-to-park Tour. That being said, we are making our best effort (thus far successfully) to visit in prescribed order, all twelve of the National Parks originally mapped out for the 1920 Tour, and to experience the roads and points of interest in the Parks outlined in the original or actually visited by the Tour group. Actually, with our recent visit to Lassen Volcanic National Park and our intended visit to Zion National Park (neither of which, for good reasons, the 1920 Tour did actually accomplish), we hope to make up for our lack of tracing the actual path by visiting all of the Parks laid out in the original plan. So there..
OK, back to Lassen Volcanic National Park. After a super, reasonably priced breakfast in the town of Old Station (population 51), we drove the 14 miles to the northwestern entrance to Lassen Volcanic National Park where at the Visitors Center we received very helpful directions to those features assessable to the day visitor such as ourselves. 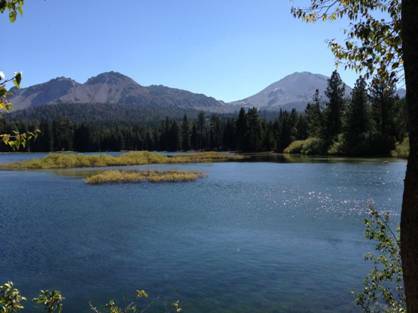 At the Park Ranger’s suggestion, we started our tour of the Park with an easy ½ mile walk along the shore of Manzanita Lake to a point where we could see Crescent Crater and Lassen Volcanic Peak across the lake; jutting up above the tree tops some five miles distant*. Great way to get the juices flowing. *Do you like my use of varied punctuation to break up run-on sentences? Then anticipating the consumption of a fair amount of fuel making it to the top of the 8,500 foot pass across the Park road, we topped of our gas tank we and headed out to our next stop – labeled on the Park map as “Devastated Area”. This is where the circa 1915 eruption and resultant mud flow caused by the melting of the snow cap, wiped out the forest below for a distance of three or more miles toward the point where we stood. We took a photo of the Jeep in the same location where Benjamin F. Loomis took a six photo sequence over a period of 20 minutes of the 1914 eruption that preceded the more devastating one shortly afterward. The rich soil in carried down the mountain by the mud flow has supported hardy reforestation in that area. We next traveled to King’s Creek. At an elevation of 7,400 feet, the creek meanders through a lush upland meadow bordered by mature pine and fir trees towering above. Very peaceful setting with the light wind whispering through the branches. Enough of that. Jeep did well so far on the climb. We continued our assent on the Park road to Bumpass Lookout at an elevation of 8,500 feet. Not quite sure if that is pronounced. Anyway, we made it up there without anyone bumping us in the _ _ _. The spectacular view from up there helps one envision that the surrounding 8,000 foot to 10,000 foot peaks are mere remnants of a much, much larger volcano that resided in the Park. Equally amazing is the existence of a megaton bolder perched on the edge of this Overlook – the bolder have been deposited there by a receding glacier that was thick enough to have covered that location. Extremely windy up there. Glad they had opted for stone restrooms and not Porta-Potties. Please view video to get a sense of this stop. Next stop on the journey down the main road in the Park (the operative word being “down”) was the Sulphur Works. No halfway respectable Park in the west would be seen without at least something bubbling out of the earth and the longed-for aroma of rotten eggs. Actually, this bubbly pit was quite impressive with its very energetic display. Last stop on the trip through Lassen Volcanic National Park was the Kohm Yah-mah-nee (pronounced “kohm yah-mah-nee”) Visitors Center at the southwest entrance to (or in our case – exit from) the Park. We had our traditional sunflower butter & honey sandwiches on wheat bread, took one last look at the peaks surrounding us, and headed off on byways to, of all places, Reno, Nevada. Despite having portable hotspots for two different phone carriers, we had been suffering from feeble internet connectivity for the past several days. Jean had some company “paperwork” to do that required strong connectivity to our server, so we elected to hold out in Reno for a couple of days to get caught up. Will probably head out for Yosemite (pronounced “yosemite”) on the September 23, 2013. Thanks for following us on our adventure. Sorry we missed seeing you in Yellowstone. Was unable to see the photo of your wagon. Feel free to send it to my direct at dan@ati-engineers.com. What a great read. Thanks so much for keeping us up on your adventure. I wish i had found this a bit sooner, i live just outside of w. yellowstone and would have loved to have toured the park with you in my ’59 stock wagon. (See me, willys59 at old faithful posted here). I have often thought about doing the old Yellowstone Trail from Chicago to Seattle. Kinda like the early rt. 66 . Keep on pushing on, and hopping for that big sun flair EMP to knock out them nasty computerized road hogs so you can have the road to yourselves. Be safe, good luck and holler if ( or should i say when) you have more problems like that bad gas….. I mean fuel. Your on your own with any other kind of bad gas. There’s lots of us out here ready to lend a hand. it’s a jeep thing! The Going-to-the-Sun road was a concern from the planning stages. Happy we made it thru without having to wait out the weather. With the exception of a couple of rainy days and some fog, we have had great weather. The Crater Lake rim road drive was something else! Great posts! Glad you were at Glacier NP two weeks ago, as they closed the Sun road from the East side and had high wind advisory and potentially blowing snow!